During the most difficult times in life, humans tend to ignore their basic needs. After a separation, it's easy to overlook the simple things you do on a daily basis. You might completely overlook simple tasks like taking a shower, doing laundry, or cleaning up your home. Luckily, being aware of this possibility is half the battle. It's time to create some new routines. In your last relationship, you built habits with your ex. If you lived together, those routines were shared and intertwined completely. 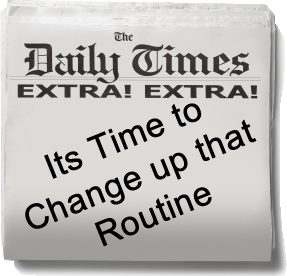 Now that you're on your own, those routines have been disrupted and confused. Quite often, men in this situation blindly ignore the daily tasks they didn't even have to think about before their separation. Whether you notice this in yourself or not, you should create some new routines to get your new independent lifestyle on track. Grab a piece of paper and a pen; seeing these tasks written out on paper will make them feel more feasible. Start out making a list of the simple daily tasks you need to accomplish. Next, write out a list of weekly tasks, then monthly tasks. These tasks can include anything such as laundry, eating breakfast, exercising, showering, cleaning the kitchen, doing yard work, paying bills, and even going out for some fun. It might seem like these tasks would be hard to overlook since you've been doing them for so long, but the effects of a separation can spread further than you think. Once you have a list of all the daily, weekly, and monthly tasks you can possibly think of, organize them by priority. Which tasks must absolutely be done by a certain time? Which tasks can wait a couple of days? Seeing them there will make your goals feel much more attainable. In time, this list will become your routine and you won't need to look at it to keep track of your tasks. Once you have prioritized your tasks, start developing a routine schedule. First, write down what you will accomplish on Monday, Tuesday, Wednesday, and all the days of the week. Get these daily tasks out of the way first, like showering and eating healthy, so you know how much time you will have to work on other significant tasks. Next, make your weekly routine schedule. This will include things like cleaning the house, doing yard work, and cleaning your laundry. Finally, make a monthly routine that includes anything from paying bills to picking up your prescriptions. Once you have created your new routine, begin implementing it. Take the first daily task on the list and finish it. Not only will this push you to take better care of yourself, but it will help keep your mind off of your ex. It may help to make multiple routines for your personal and professional life. A separation will also affect your performance and concentration at work, so creating a routine for your professional life can be helpful as well. Make a list of your upcoming meetings, projects you need to complete, and daily tasks you must get done. Again, just having them written out in front of you will make the pressure of the situation feel much lighter. And don't forget to add fun things to your routine; if you can't think of anything, move on to step six and start pursuing your interests.